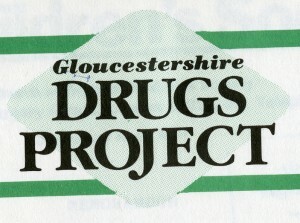 The Society became very active in Gloucestershire over the period 1987-1993. 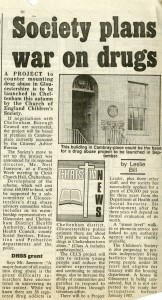 This activity generated three important projects: the Gloucestershire Drugs Project in Cheltenham; the Gloucester Diocesan Team; and Deakin House. The Society used this project to pioneer its work in this particular field. Based in Cheltenham, it provided information and counselling for young people involved in drug taking, their families and friends, and other agencies working with these young people. Training and education was also high on the project’s list of priorities as it sought to influence Social Services, Local Authorities and the local community about drug use and related issues such as the link with HIV/AIDS, and reinfection in general. The project reached out to a large number of young people, and by the end of 1987 – its first full year of operation – the advice, information and counselling centre in Cheltenham had received over 100 referrals. 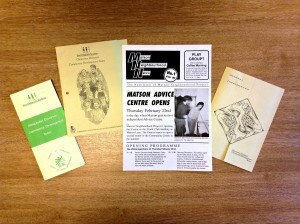 Throughout the life of the project, approximately half of the individuals seeking assistance were self-referrals, though a significant number were directed towards the project by the Probation Service and non-statutory and voluntary agencies; signifying the extent to which the project had established its presence and demonstrated its effectiveness. The project team was not large, and at its outset comprised no more than three or four full-time staff. However, enhancing the effectiveness and breadth of the project’s impact, there were a significant number of volunteer helpers. Consequently the project was able to pilot such programmes as a needle and syringe exchange scheme, and undertake initiatives with the Prison Service and engage directly with soon-to-be-released prisoners. From August 1990 the project became an independent company, though The Society’s presence was maintained thereafter through the secondment of one of its key staff. Subsequently, the expertise developed by the project saw it being absorbed within the county-wide drugs service, for which Local Health Authority funding was provided, in March 1992. The Gloucester Diocesan Team was launched in 1988, and as such was one of several diocesan teams created by The Society in the West and Wales Region during the late 1980s. The aim of the team was to co-ordinate work with the Church (through the Diocesan Board for Social Responsibility) and local community groups, and to help people improve the quality of life in their own neighbourhoods. In the process of doing this it sought to achieve two main things; firstly to build a sense of community, and secondly to help people plan strategies and find resources to overcome problems within their communities. Once established, it was anticipated that such initiatives would run autonomously or with relatively little intervention. 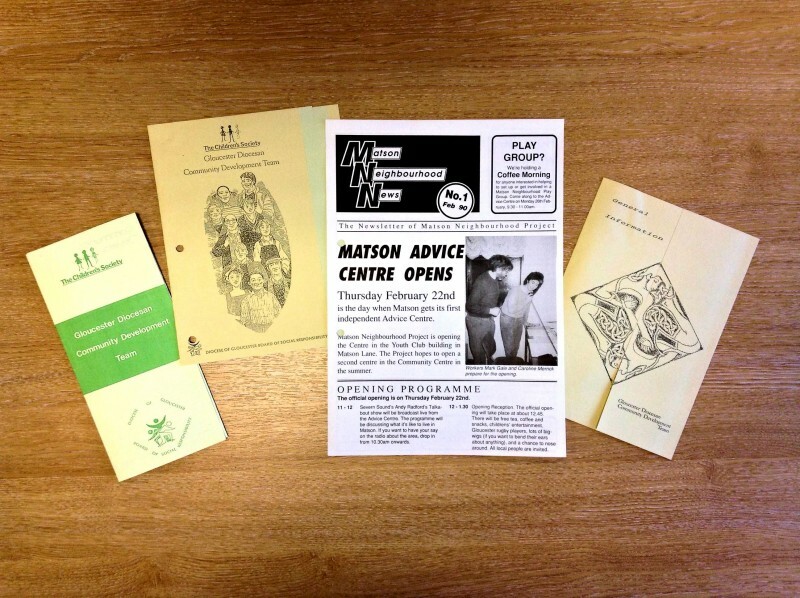 The range of activities undertaken by the Diocesan Team was extensive, and included such initiatives as the Northleach Deanery Youth Project, the Cheltenham Parents Support Group, the Matson Neighbourhood project in Gloucester, and Winnie Mandela House – a multi-ethic project for homeless young people, again located in Gloucester. The Team’s activities were spread throughout the diocese, and reached beyond the larger urban areas of Cheltenham and Gloucester extending to locations such as Stroud, the Forest of Dean and rural locations such as Cromhall and Dursley. The Society’s formal involvement ceased in March 1993, when activities were transferred to the full control of the Diocese. However, to smooth the transition, The Society continued to fund the presence of a Community Development worker for a further two years. The third strand of The Society’s activities in the county was this short-term project started in 1989. 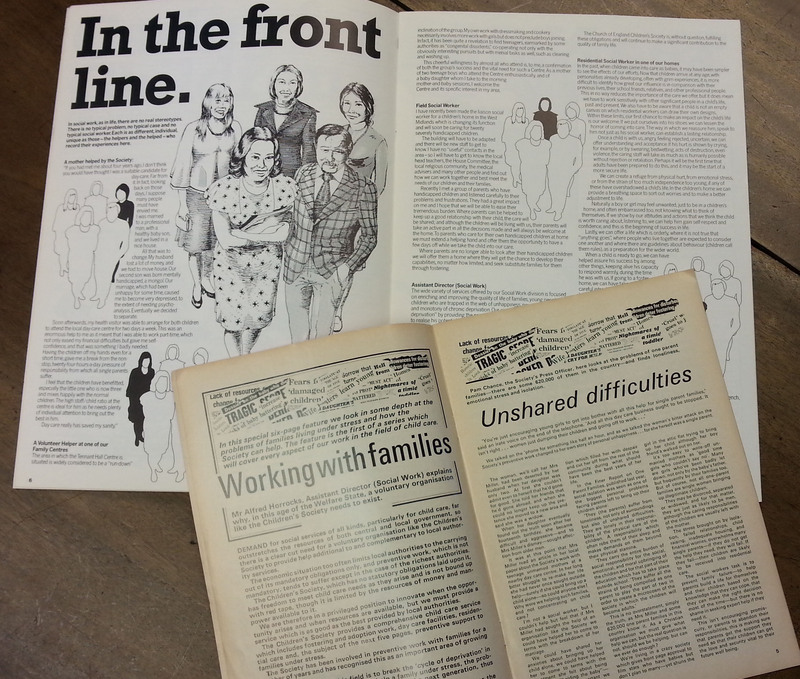 ‘Independent Living’ schemes – whereby young people leaving care are provided with their own rooms, shared facilities, and the opportunity to manage their own lives – were pioneered by The Society in the late 1960s, and Deakin House was established in this vein. The project was developed in partnership with Gloucestershire Social Services and the Gloucestershire Churches Housing Association, and The Society’s main area of input was the provision of a non-resident project co-ordinator. The hostel provided a home for up to 6 tenants with limited supervision. The project worked to provide advice and support in preparing for adult life, and allowed the young people residing there to have direct experience of housekeeping skills such as budgeting, cooking and shopping. The Society’s involvement with Deakin House – which continued to be a bedsit hostel – was short-lived, and its responsibilities were transferred to the management of local agencies 1990/91. 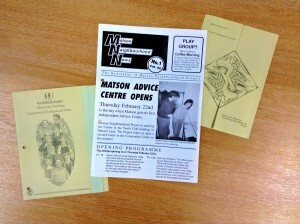 Records relating to all three projects are held at The Children’s Society Archive. 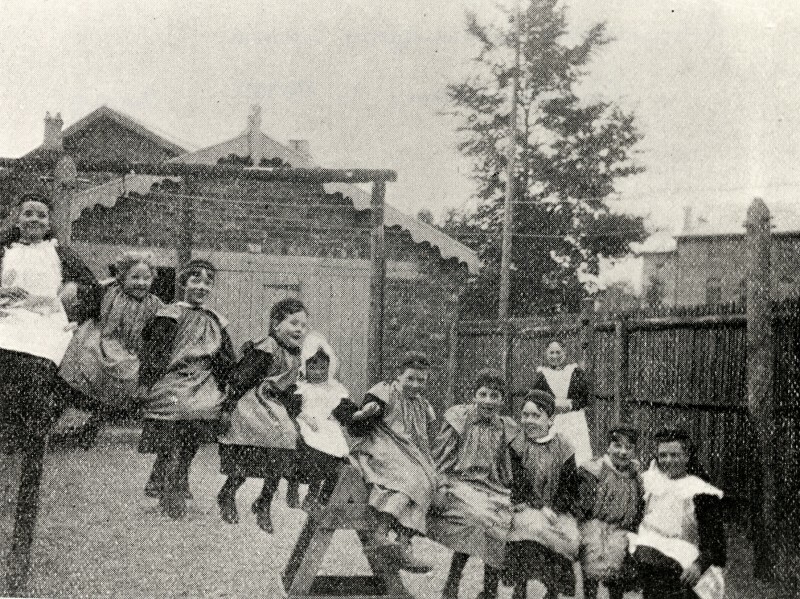 Another in the series of our blogs that take a look at the history of The Children’s Society’s former children’s homes and social work projects since 1881 – this time in Gloucestershire. 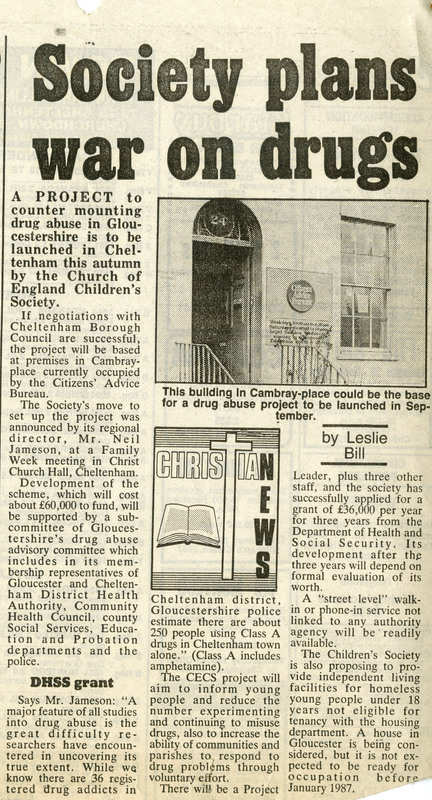 The Children’s Society has had a long association with Gloucestershire running a number of children’s homes and social work projects in the county over the years. This child care activity fell into two main periods, 1897-1954 and 1987-1993. 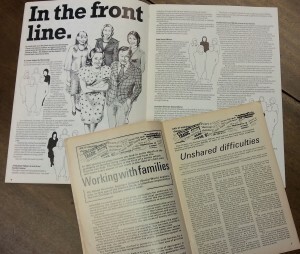 These phases in part reflected the changes in the Society’s child care provision as it moved from residential child care into the new world of specialist social work projects and helping children, young people and families in their own communities. This blog looks at the first of these phases, 1897-1954, when The Children’s Society ran two residential children’s homes in the county. During this time The Children’s Society was known as the Church of England Society for the Provision of Homes for Waifs and Strays – or, ‘Waifs and Strays’ for short. In 1946 the title changed to the Church of England Children’s Society. The most important home during this period was St Monica’s Home for Girls in Cheltenham. The Society took St Monica’s over in 1897. The home, which was originally known as the Frances Owen Memorial Home for Little Girls was founded in 1885 by a leading member of the Cheltenham Ladies College, Miss Sawyer. Situated at 2 Alexandra Villas, Hewlett Street, the home ran into financial difficulties during the 1890s and asked the Society to take it over. The Society renamed the home the Gloucester Diocesan Home for Little Girls. During these early years the Society’s Annual Reports describe the home as being a ‘cottage home’ for 12 girls aged between 7 and 12. 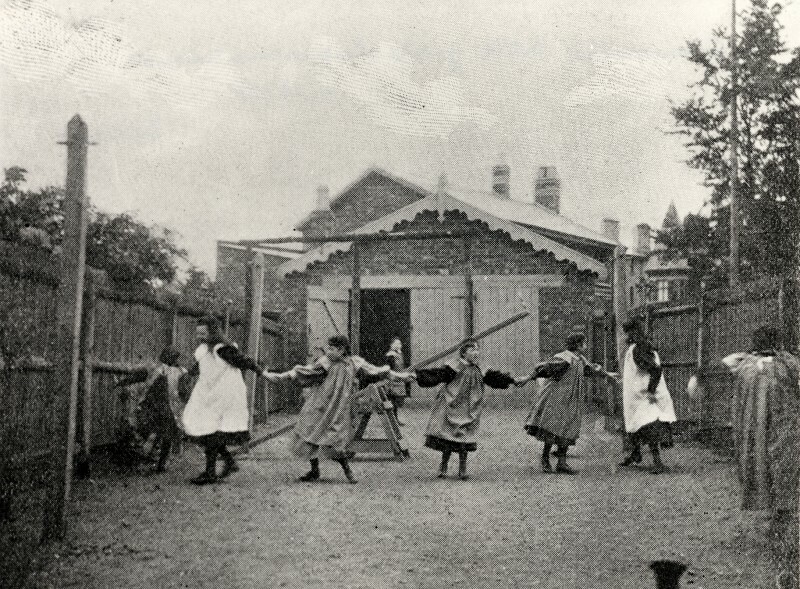 The cottage home or family-group home system was Edward Rudolf’s alternative to the large institutionalised children’s home that was so common in the nineteenth century. He wanted to establish homes that had only a small number of children cared for by a master and matron who would act like a mother and father to them. Every home was also supposed to have a pet cat or dog to complete the homely atmosphere! By the early 1900s the Society was being asked to care for ever increasing numbers of children. By 1906 it was clear that the home had outgrown its premises and needed to find a new site. In 1907 it moved to larger premises at Battledown Grange, Charlton Kings, Cheltenham, and renamed St Monica’s. It remained here until it closed in 1954. This is not to say that nothing changed between 1907 and 1954. The most significant change during these years occurred in 1947 when a decision was made to convert the home into a residential nursery for children aged 0-5 and a training college for nursery nurses. 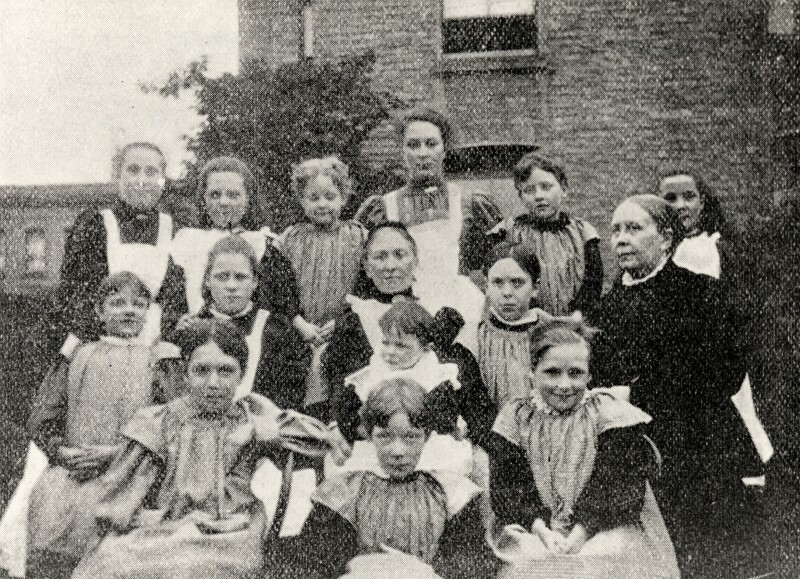 The Society was a pioneer of both residential nursery provision and nursery nurse training. The Society’s ‘ABCD’ (Association of Baby and Child Welfare Diploma) course was started in 1942 and was used as the model for the Ministry of Education’s National Nursery Examination Board (NNEB) scheme. The first term for the students at St Monica’s commenced in February 1948. They attended a specially devised nursery nursing course at the North Gloucestershire Technical College and were able to put theory into practice when they returned home to the nursery. The Society acquired this home in 1905. The home had been set up by Miss Ellice Hopkins, who is described in the 1915 edition of the Society’s supporter magazine ‘Our Waifs and Strays’ as being “the friend of friendless girls”. Little is known about the history of Charlton House when it was managed by the Society, save that it was closed in 1915 on the grounds of “the immediate surroundings being detrimental to the proper upbringing of children”. Plans to build a new home in the town were defeated by the full force of the First World War. What was it like to live in a children’s home run by the Society during these years? The survival in The Children’s Society’s Archive of correspondence, annual reports and inspection returns for St Monica’s makes it possible to compile a useful picture of daily life there. The girls at the home were expected to contribute towards a number of domestic tasks. These included housework, making beds under supervision, setting and clearing tables before and after meals and helping in the kitchen and scullery. The girls at the home attended the local Anglican school, All Saints. Sundays were taken up with numerous visits to church and Sunday school. 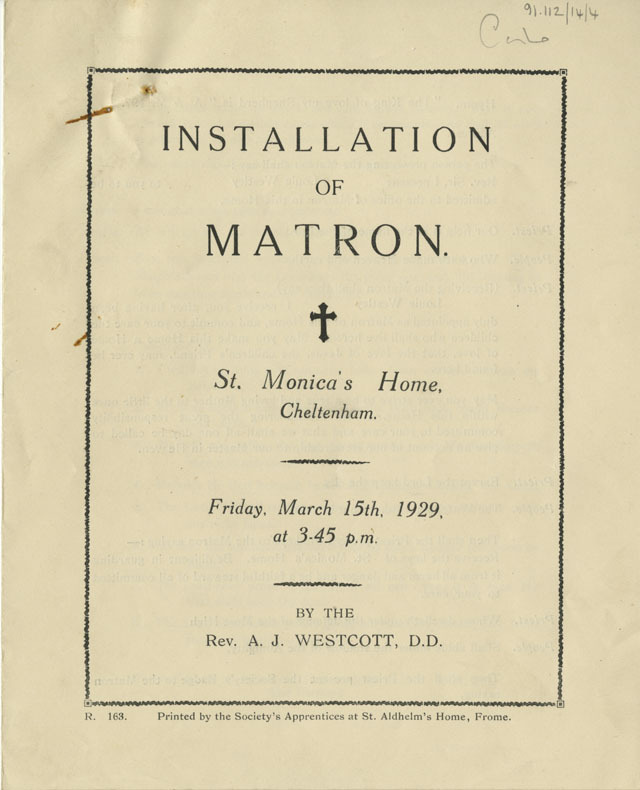 In 1915 and for much of the time up until the 1930s the children went to the morning and evening service at the Church of the Holy Apostle, Charlton Kings, Cheltenham, and had Sunday school at the home. The girls were trained mainly in the skills needed for domestic service. In 1912 there was mending of clothes after tea and in 1913 the girls were reported to be making clothes and knitting socks. The older girls who were nearing the end of their schooling were known as ‘house girls’. They were found positions with local people as trainee housemaids and domestic servants. Every girl that left the home was found a place either at one of the Society’s training schools or in work. Outside of the world of school and domestic chores, the children had their ‘play nights’ with toys and a large play room. The inspection reports for the 1910s and 1920s reveal that the home had a library that the children could use, although the books had to be checked by matron before they could be issued. The 1912 report noted the children played croquet and skipping, and had the doubtful pleasure of drilling or physical exercise once a week. The 1920s saw the development of a singing class, which was followed in 1937 by a percussion band. 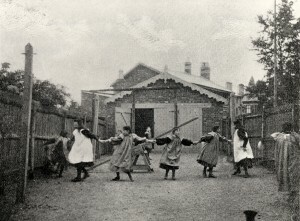 Members of the local community often provided entertainments for the home. In 1919 music and dancing was taught on Thursdays by Miss Booth, while Miss Atwell Parker played with the girls on Monday evenings and Mr Daniels entertained them on Tuesday evenings. The children would be treated to tea by the parish and its incumbent, something that the ladies of the Cheltenham Ladies College were keen to do during the 1930s. The local community was generous in providing gifts of clothes, food and household equipment, and harvest time would bring in a wide variety of fruits and foods. ‘Pound Days’, when local people brought in pound weights of produce or gave a donation of £1, were particularly helpful on this front. Similarly Christmas brought donations of presents, food and a Christmas tree. The children would be entertained with singing and a nativity play. During the summer there was an annual summer fete that the children were very much involved with, and, best of all, a holiday. Most of the Society’s homes had strong links with the Girl Guide and Scouting movements. 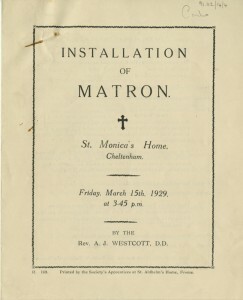 It was not until 1925 that it was suggested that St Monica’s should form a Girl Guide troop. The troop was clearly successful and by 1929 there were 12 Guides and 10 Brownies. A year later in 1930 the St Monica’s Guides won the County Shield for sports. The health and welfare of the children at the home during these years was above average when compared to standards of living and health care to be found in society generally at this time. Regular inspections of the girls were made by the home’s medical officer. By the 1930s the children were being weighed quarterly, a record of their individual weights being kept by the medical officer. The home had its own isolation wing for treating infectious illnesses, and had an arrangement with the local fever or isolation hospital – the Delancy Hospital – to provide care and treatment for more serious cases. Although the girls were given periodic dental inspections during the Edwardian period, this aspect of their health was put on firmer footing in 1919 when the home made a formal link with a dental practice, namely, Messrs Peake and Holmes Barnett “who give their services entirely free of charge”. In terms of personal hygiene, the annual inspection reports indicate that all children were given daily baths (1912 and 1913 Inspection Reports). Hands were expected to be washed before meals and every girl had her own flannel and soap. The 1912 inspection report notes that every girl had her own hair brush, comb and toothbrush; by 1931 these items had to be given distinctive marks to ensure that they were always used by the same child. Every child had a small ‘wardrobe’ of clothes that included two pairs of boots, a pair of slippers and a daily supply of hankies. 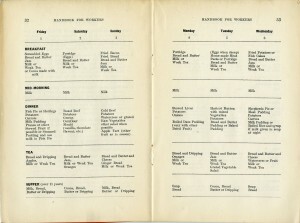 Mealtimes at the home were 8am for breakfast, 12.30pm for dinner, 5pm for tea and 8pm for supper. 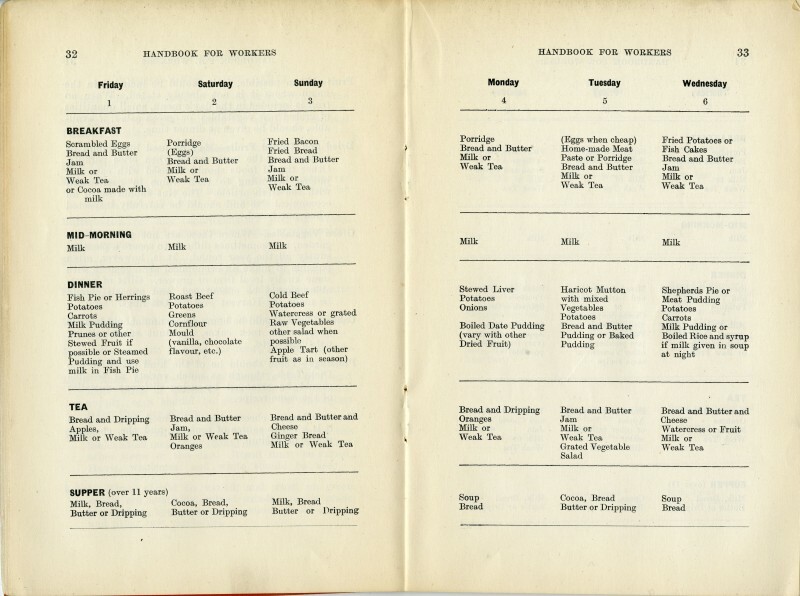 Although no dietary record has survived the meals would have been similar to those specified in the Society’s procedural handbook ‘Rules for Workers’.